PORTLAND, Ore. (PAI) – In yet another sign that workers will walk away from backers of “fast-track” trade laws and the so-called “free trade” pacts they implement, Oregon’s labor-backed Working Families Party has nominated Longshore and Warehouse Union Local 8 member Shanti Lewallen to run against incumbent Democratic Sen. Ron Wyden this fall. “We’re taking on Senator Wyden with stand-alone candidate Shanti Lewallen over the TPP,” the party said in a statement. The TPP (Trans-Pacific Partnership) is the controversial 12-nation “free trade” pact that Wyden helped clear the way for earlier this year. An ActBlue funding appeal for Lewallen also notes he backs universal government-run single-payer health care, one key cause of Sen. Bernie Sanders, Ind.-Vt., and his backers. Sanders, who has voted against every so-called “free trade” pact and who strongly opposes the TPP, won the Oregon Democratic primary against now-nominee Hillary Clinton. The party’s nomination of Lewallen, now a pro-worker attorney specializing in wage theft and discrimination cases-while remaining an ILWU member-sets up a four-way race this fall. Also running are Republican Mark Callahan and Independent Party nominee Steven Reynolds. They and Lewallen are first-time candidates. Wyden is heavily favored. 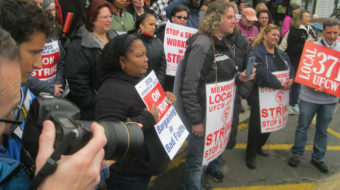 The Working Families Party, which also has chapters in other states and D.C., has drawn financial and other support from seven Oregon unions – United Food and Commercial Workers Local 555, Operating Engineers Local 701, Communications Workers Local 7901, Teamsters Local 206, Laborers Local 483, Electrical Workers Local 48 and Unite Here Local 8 – as well as Lewallen’s home union, the Longshore and Warehouse Workers. Wyden used his current perch as top Democrat on the Senate Finance Committee, which considers trade legislation and pacts, to help craft this year’s version of “fast-track,” the law that lets a president submit free trade pacts to Congress and bars lawmakers from changing them, while limiting debate and constituent comments. And the pacts need only up-or-down majority votes. But committee chairman Orrin Hatch, R-Utah, did most of the writing. Lewallen is not the first person this year to challenge Wyden over the TPP. Medford city councilor Kevin Stine won 13 percent of the vote, to Wyden’s 83.6 percent, in the state’s June 8 Democratic primary. A third candidate took the rest. 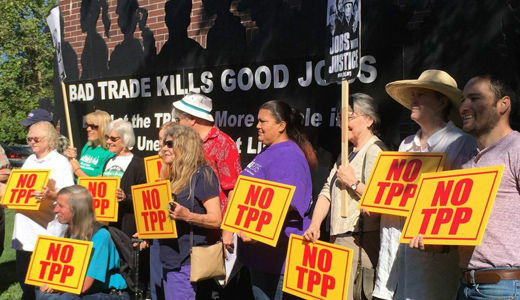 Workers, unions and their allies campaigned hard to stop fast-track – and thus the TPP – earlier this year. Wyden pushed just as hard to enact it. He’s up for re-election this fall, and if he wins and the Democrats win back the Senate, he would take over the Finance panel chair. In most other elections in Oregon and elsewhere, the WFP selectively cross-endorses other parties’ progressive candidates. It’s doing so for Rep. Peter DeFazio (D), who represents Portland, and who is seeking re-election. DeFazio opposed the TPP, while the state’s other U.S. representatives from both parties backed it. In Oregon, WFP has its own ballot line. 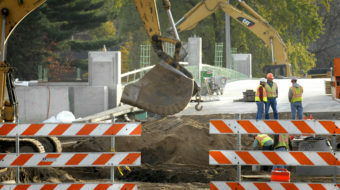 The Northwest Labor Press contributed material for this story. Photo: Matt Findley, Oregon Fair Trade.